Jim Mackie – Animal Training and behavior officer, Zoological society of London. 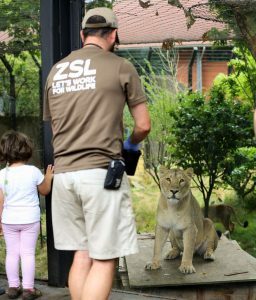 Jim was appointed The Zoological Society of London’s (ZSL)’s first Animal Training and Behaviour Officer in 2012 having previously demonstrated the value of trained behaviors to improve husbandry and welfare in the zoo’s living collections. Jim’s passion for sharing information in the field of operant learning and behavioral enrichment led to the formation of ZSL’s Behaviour Management Committees, at both London and Whipsnade Zoo and later the BIAZA British and Irish Association of Zoos and Aquaria (BIAZA) Animal Behaviour and Training Working Group which he chairs. 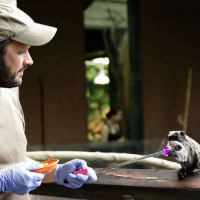 In this capacity Jim is now working with the Animal Behaviour and Training Council, to create a formalized education and accreditation programme for animal trainers in zoos and aquaria. Jim is also a member of the EAZA (European Association of Zoos and Aquaria) Training Group and is an EAZA Academy Instructor. In 2015 ZSL was the recipient of a BIAZA gold award in the welfare category for its work in establishing a coherent, collection wide animal training programme for veterinary and husbandry care. At present at London Zoo alone there are around a hundred species of mammal’s bird’s reptiles and fish participating in training programmes for husbandry across all animal departments and the number of species involved and the variety of behaviors being trained is constantly growing. In this podcast episode Jim mentioned the names of some of ATA’s previous podcast guests. Click the links below to learn more. Within the membership you can get access to twice monthly live web-classes, the back catalog of previous web-classes, plus a huge library of videos & projects to problem solve different training situations. And we’re a sociable bunch with an exclusive private Facebook group, forums area, and WhatsApp chat groups. It’s like Netflix for animal behavior nerds.